^ "National and Regional Food Specialities", Angloinfo Luxembourg. Retrieved 08 June 2016. ^ "Luxembourg Recipes", Luxembourg Tourist Office, London. Retrieved 30 November 2011. ^ "Éisleker Ham", Mycitycuisine.org. Retrieved 30 November 2011. ^ "Judd mat Gaardebounen", Mycitycuisine.org. Retrieved 30 November 2011. ^ "Hong am Rèisleck" Mycitycuisine.org. Retrieved 30 November 2011. ^ http://www.mycitycuisine.org/wiki/Huesenziwwi Huesenziwwi Mycitycuisine.org. Retrieved 30 November 2011. ^ "La boulangerie-pâtisserie", VisitLuxembourg.lu （フランス語） Retrieved 30 November 2011. ^ "Culinary Luxembourg", eu2005.lu. Retrieved 30 November 2011. ^ "Tiirteg ou Galettes de pommes de terre et de choucroute ( luxembourg )", Recettes de France et d'ailleurs. （フランス語） Retrieved 1 December 2011. ^ "Rieslingspaschtéit", Mycitycuisine.org. Retrieved 2 December 2011. ^ "Intro", Luxembourg: Vins & Crémants. Retrieved 2 December 2011. ^ "Quality", Luxembourg: Vins & Crémants. Retrieved 2 December 2011. ^ "Bières", Luxembourg.lu. （フランス語） Retrieved 2 December 2011. ^ "Wine and Beers of Luxembourg", Anglo Info Luxembourg. Retrieved 2 December 2011. ^ "Local products - Luxembourg specialities", ONT Luxembourg. Retrieved 9 December 2012. Georges Hausemer, Guy Hoffmann et Sylvie Bisdorff, Culinary Luxembourg: Country, People & Cuisine, Éditions Guy Binsfeld, Luxemburg, 1997, 236 p. 9782879540528. Tun Nosbusch, La Cuisine luxembourgeoise, Éditions Guy Binsfeld, 14 p. 9782879540108. 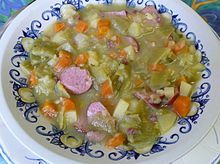 Luxembourg cuisine from Mycitycuisine.org with links to many traditional recipes.